5 entrepreneurial start-ups battle it out to become the next purple cow. 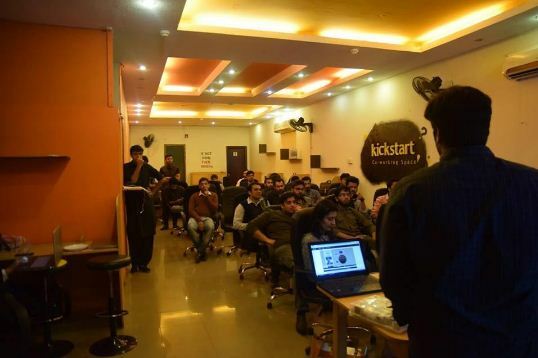 In the field of monochrome Holsteins, entrepreneurs gathered again for the 4th edition of the Purple Cow event hosted by Kickstart-co working space and Freshstart.pk PR, in pursuit of the next Purple Cow. Following a selection of five startups from the contesting herd, the qualifying young entrepreneurs demonstrated their ideas to a technically literate audience. The qualifying startups included Callivun, Nazdeeq, Aitomation, DIY Geeks and Sehat. Just as the name suggests, this startup aims to provide emerging markets with direct access to buy from international online stores. Nazdeeq is a local buyers dream come true – it combines the opportunity to explore amazon.com and pay in cash. Currently, they are taking orders from family and friends but they will soon be launching their operations for the general public. This interesting mobile app becomes your personal nutritionist. Not only, does it provide recommended exercises posted by gym training instructors from around the world to enthusiasts but also suggests healthy recipes from varied international cuisines.The nutritionist algorithm has been built with the help of Singaporean and Pakistani nutritionists. Furthermore, the app assesses a user’s daily nutritional needs and the algorithm prepares a menu suggestion that suits the individuals’ nutritional requirements precisely. Users can then select the menu choices and get the meals delivered anywhere. The app has quickly gained popularity but the services are currently available in Lahore only. The company is looking to tap into Pakistani, Australian and South-east Asian markets in the upcoming years. This is Pakistan’s first of its kind online pharmaceutical store. Sehat is a project of Apothecare Private limited. This online drug store offers a variety of medications, both over the counter and prescription drugs. Sehat follows strict prescription verification policy before dispensing any prescription drugs. They also offer door to door vaccination services and keep the public posted about various diseases and health care conditions via their online blog. This is a major contribution to the e-commerce in addition to providing convenience for the Pakistani population. This community based startup facilitates makers, engineers, geeks, nerds and innovators to make programmable electronics themselves. DIY Geeks is offering one stop solution via their online website which showcases easy DIY tutorials and pairs the tutorials with the essentials/components required to build them. Furthermore, in order to get the creative juices flowing, they offer meetups and workshops, which provide hands-on sessions in ‘making stuff’ and innovating ideas. DIY Geeks is also a platform for engineering students where they can buy unavailable or redundant components for their projects. They have also introduced interesting trends like Drone Racing, Drone making, 3D printing, Drag and Drop Electronics etc. This DIY culture has huge potential to bring forward new equipments aimed to ease and automate ordinary peoples’ lives. This startup is a computer automation solution for businesses with a promise to automate redundant and repetitive tasks through intelligent software. The replacement of ‘U’ with ‘I’ in automation is not the only thing that sets the idea apart. Aitomation offers tailored automations to companies as per the company’s requirements and unique needs, hence avoiding IT department hassles, along with saving time and money. Currently, the startup employs five people and profits to their name as well. Their biggest achievement to date is selling the product to GIC – the largest sovereign wealth fund in the world. Purple Cow’s event has yet again proved to be successful for entrepreneurs in terms of showcasing their products in front of tech literary audience, generating valuable feedback from the audience besides obtaining critical appraisal which proves beneficial for improving products. Purple Cow’s focus on technology and the continuous search for the next best thing allows innovators to push their boundaries every single time and bring forward new ideas and solutions in a welcoming environment.